We are pleased to announce that IMAN’s Health Center has been officially designated as a Federally Qualified Health Center Look-Alike! The rigorous effort toward obtaining such a significant status has been nearly a decade in the making. With your support and the hard work of our dedicated staff, IMAN’s Health Center has demonstrated the compassion and high-quality care for patients that impressed federal government evaluators. Health Center Look- Alikes provide services consistent with federally qualified health centers, ensuring health care for all, regardless of ability to pay. 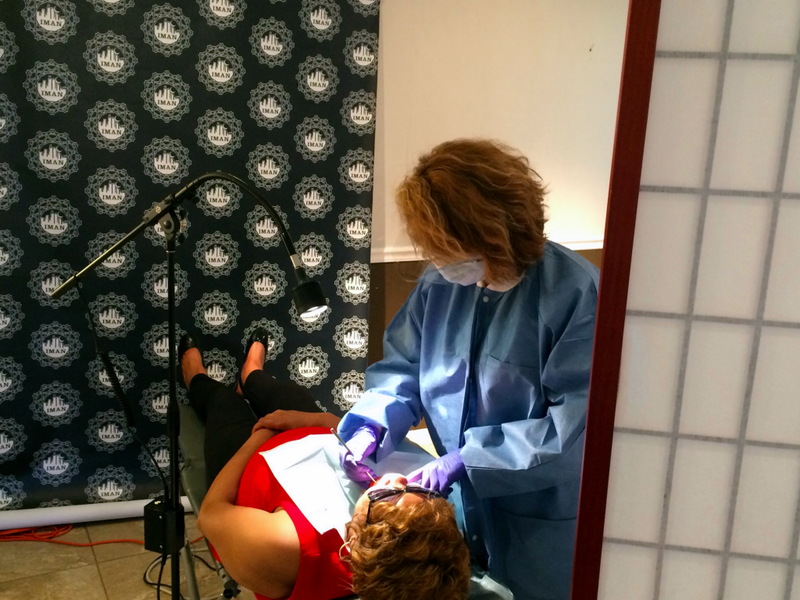 Over the past two decades, IMAN has expanded its medical service to include counseling and dentistry. Now, we are being recognized by the federal government for the community-responsiveness and quality of the entire health program. Such recognition means we’ll have access to additional training and expertise through state and national agencies. Additionally we will become part of Chicago’s larger health safety net able to serve more patients and expand pharmaceutical, dental and mental health services. 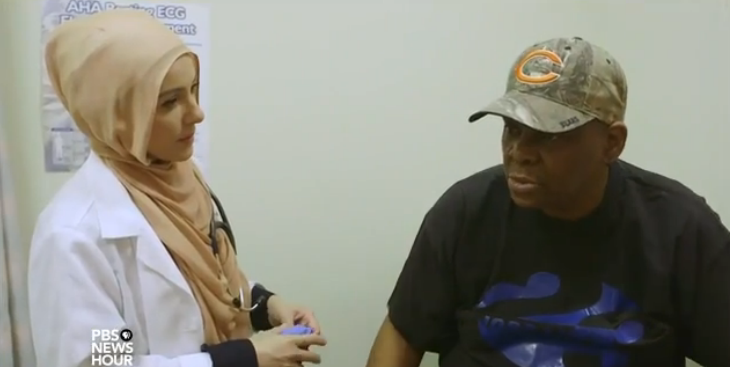 FQHC Look-Alikes were established to increase access to quality care in underserved communities by allowing providers like IMAN, that do not receive a federal grant, to participate in the federal program. As an FQHC Look-Alike, IMAN is eligible for increased Medicaid and Medicare reimbursements. However, those reimbursements do not cover uninsured individuals, who make up nearly 50% of our patient population. This designation is a powerful affirmation of our Health Center’s quality and growth. It is also a resounding call to action, as we continue to raise the funds necessary to fully cover the costs of uninsured patient care, fostering health, wellness and healing for thousands more individuals across the inner-city. This exciting milestone would not be possible without your prayers and generosity, and we are immensely grateful for the long-standing support of many individuals and families, and of several foundations over the years, including, Islamic Relief USA, Chicago Community Trust and Affiliates, Grant Healthcare Foundation, Lloyd A. Fry Foundation, VNA Foundation, Field Foundation, Illinois Children’s Healthcare Foundation, Blue Cross Blue Shield of Illinois, Healthy Communities Foundation, The Crown Family, Polk Bros Foundation, United Way of Metropolitan Chicago, and Zakat Foundation of America. IMAN is pleased to announce the addition of a new team of Health Navigators to its growing Health Center staff. In collaboration with Chicago Public Schools, Health Navigators will help to ensure that local parents and children are enrolled in health insurance through the Affordable Care Act (ACA). 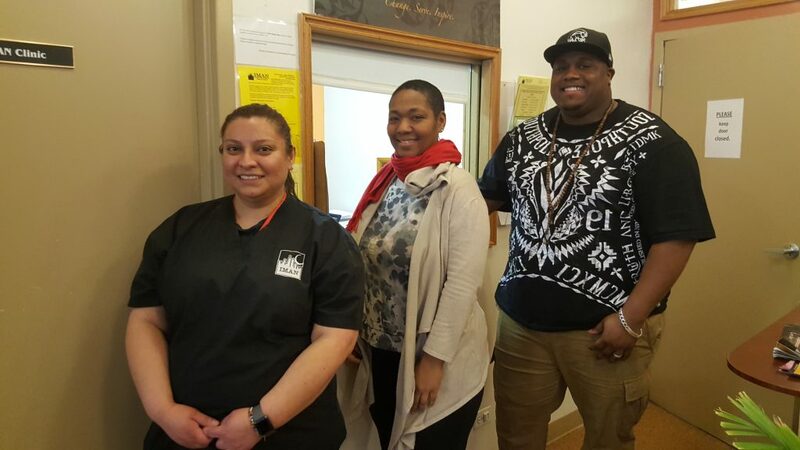 IMAN trained two current staff members, Medical Assistant Rosa Mandujano, who serves as a bilingual English-Spanish navigator, and Organizer Robert Jones to take on this crucial role. Additionally, Donica Ousley was recruited and hired as a full-time Health Navigator. As a part of their certification process, the trio completed nearly 100 hours of comprehensive training over a four-week period of 4 weeks. fighting for the health and wellness of Chicagoland communities. Our Health Navigator team is a significant step forward as we continue building trust and relationships with families who need and deserve access to healthcare. This month’s Senior Wellness Luncheon hosted by the Health Center, focused on providing senior citizens with ways to protect themselves in dangerous situations. Ramy Daoud, owner and head coach of Phoenix Sports Empire in Naperville, introduced the seniors to basic self-defense techniques during the hour-long session. Seniors learned various blocking methods and proper movements to handle and escape a potential attacker. Those in attendance were excited to try something new and felt that learning self-defense skills is extremely useful in today’s environment. 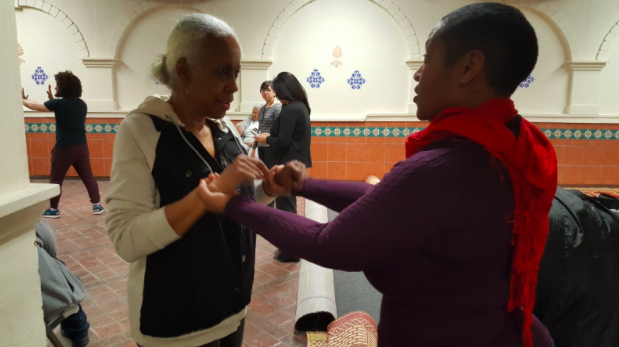 The self-defense lesson also included methods for seniors with limited mobility like Rosemary Meriweather, a 66-year-old grandmother using a rollator walker who feared the hands-on session would not be useful to someone like her, “He showed me what I can do”. Self-defense is extremely important, specifically for older adults as they are seen as a vulnerable population. Participants were asked topics of interest and self-defense rated amongst the highest. Instructor Daoud, who has been doing martial arts for 25 years and currently works as a professional fighter, says it is a skill everyone should have and he looks forward to returning to IMAN to lead more sessions. The senior luncheon highlights a sense of purpose, feelings of belongings, increased self-esteem, confidence and improved physical and mental health. The luncheon allows participants to nurture their soul by socializing, keeping active and building connections with others in the community. True to IMAN’s mission of fostering health, wellness and healing, the Community Health Center enjoyed significant growth in both facilities and personnel in 2017. 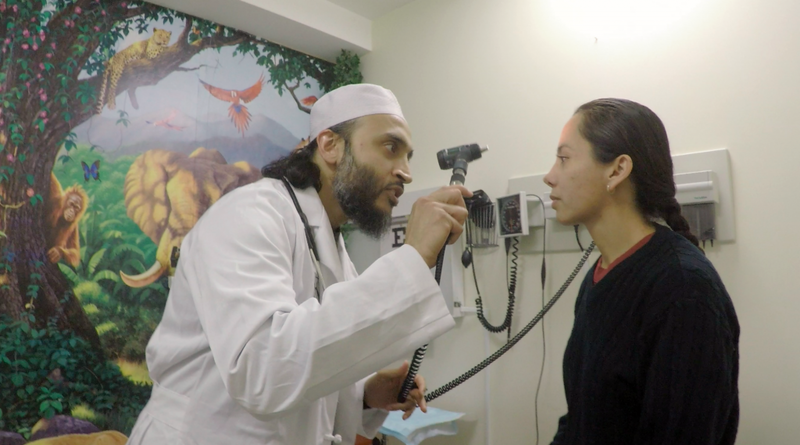 Through a partnership with Islamic Relief USA, the Youth & Family Health Center opened in the fall to offer direct services to some of the community’s most vulnerable individuals. As our reach expanded, IMAN hired several additional health providers and administrative staff to better serve patients. The staff now features seven full-time equivalents and seven volunteer medical providers. The Community Health Center successfully applied as a Federally Qualified Health Center “lookalike”, and was given a passing grade upon initial review. This represents a major step forward in the Health Center’s evolution from a free clinic into a full-fledged, federally qualified operation offering a wide range of healthcare options to underserved communities. With over 3,700 patient visits this year, the possibilities for deeper, more prevention-centered levels of care are sky high. In addition to primary care, IMAN’s Behavioral Health saw 1,200 patients in 2017. 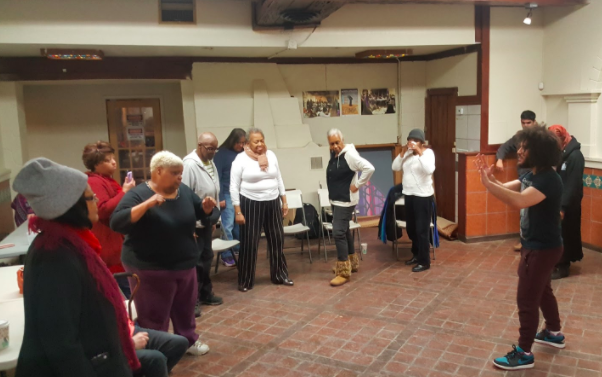 The dynamic team of licensed counselors, social workers and bright young interns integrated their healing techniques into programs ranging from Green ReEntry to the Beloved Community Ceramic Arts Studio. The recently formed partnership between IMAN and the Chicago Muslim Dental Society (CMDS) yielded significant, mutual benefits. After the formal launch of a biweekly “working group” last month, IMAN’s Oral Health work has received crucial advice on best practices, generous donations of industry-standard equipment, and a growing pool of volunteer dentists. We ask you to keep the efforts of all of IMAN’s holistic healthcare staff in your prayers as they continue to serve the Chicagoland community. Interested volunteers and interns should contact info@imancentral.org for more information. We ask The Most High to make us worthy of your continued support.